We love a delicious curry in our household, it is a regular feature on our Meal Plans. Instead of buying expensive takeaway versions or using pricey prepared sauces, I usually make it from scratch. 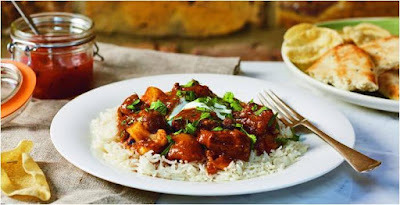 Cooking the curry in our slow cooker means it is ready when we are and it is a very low faff dinner, great for a Friday night when we are all tired and are tempted by a takeaway. I'm taking part in the Simply Beef and Lamb #LivePeasant campaign which is encouraging us all to embrace a rustic and simple one pot style of cooking using cheaper cuts of meat that are perfect for slow cooking. When they suggested I try this recipe, how could I say no?! A low fuss and tasty curry that basically cooks itself, result! My family thought this curry was delicious and have asked to have it again very soon. Such a quick and easy dinner option, just measure everything into the slow cooker and turn it on. That's it. Our Friday night dinner was scrumptious and a very welcome easy meal after a long and difficult week. Put all the ingredients except the yogurt and coriander in large slow cooker. Mix well to combine. Cook on high for 4-6 hours or low for 8-10 hours. When ready to serve, garnish each plate of Rogan Josh with a dollop of yogurt and sprinkle of fresh coriander. 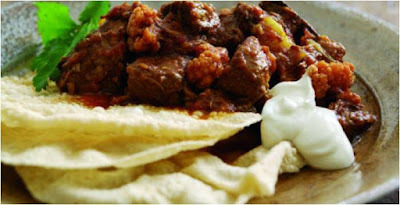 Best eaten accompanied by cooked basmati rice and poppadoms or naan bread. You don't get much simpler than this! Love that all the spices and ingredients are fresh, not the usual jars of sauces. 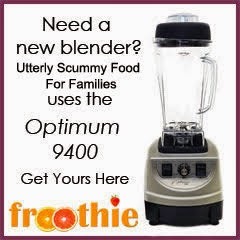 This all makes it much healthier as well, so I'm looking forward to trying it! This is timely. We ate out this week and KP ordered rogan josh. Enjoyed it tremendously it was a really old school type recipe. This sounds quite similar - dare I say it 'British style'. A good reminder to cook this kind of food at this style of food at home rather than eating out.